This 9mm +P cartridge by Corbon Glaser has a 100 grain bullet. That is relatively light for the caliber, which means less recoil and faster follow-up shots. 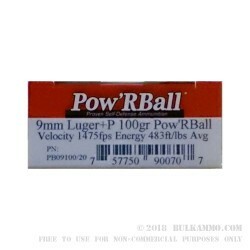 What makes this bullet truly special is its proprietary Pow’RBall design. The bullet is a gilding metal jacket with a V-shaped lead core. A polymer ball is inserted into the cavity and crimped in place by the copper jacket, which not only facilitates feeding in finicky pistols, but also provides controlled expansion upon impact in soft tissue with deep penetration and superior weight retention. If your pistol is choosy about what you chamber in it but you’d still like to count on it for self-defense, then discovering the Pow'RBall is like winning the lottery. The great care that Corbon puts into their production process means they take a little longer to manufacture ammunition, but the outstanding quality this results in speaks for itself. The South Dakotan company stands behind their tried and true designs, and offers a 100 percent satisfaction guarantee on all of their ammunition.